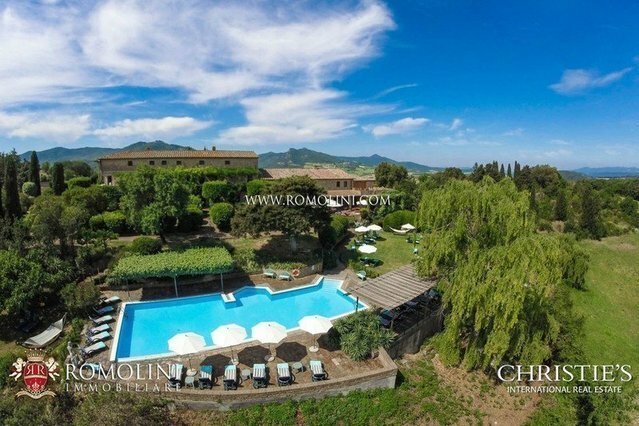 On the hills of the Tuscan countryside, in the province of Pisa, this beautiful 18th century farmhouse with 29 bedrooms (apartments and bedrooms) and 1,598 sqm of surface is perfect for those looking for a well-established and high-quality hosting business. With 2.6 hectares of land crisscrossed by paths for lovers of hiking, the property is located not far from a centre with all the services. Completing the property there is a beautiful 17 x 6 m pool with solarium. GEOGRAPHIC POSITIONIn a hilly position in the countryside in the province ofPisa, beautiful historicalfarmhousewithAgriturismo, land (2.6 ha) and swimming pool.Easily reached via the municipal road network and not far from the basic services (5km; 5rsquo;), the Agriturismo offers a quick and easy access to several of the most known towns ofTuscany: the Etruscan Volterra (23km; 30rsquo;), the wine area of Bolgheri (41km; 50rsquo;), the turreted San Gimignano (55km; 1h 10rsquo;), the medieval Siena (75km; 1h 30rsquo;), Pisa with its famous Tower (79km; 1h 25rsquo;) and the renowned Montalcino (102km; 2h).Theseasideis also pretty close, with Marina di Bibbona being 42km (50') away, Vada 44km (40') away and Follonica 66km (1h 15rsquo;) away.The airports to reach the property are Pisa Galilei (93km; 1h 15rsquo;), Firenze Peretola (111km; 1h 45rsquo;), Perugia Santrsquo;Egidio (182km; 2h 30rsquo;), Bologna Marconi (194km; 2h 35rsquo;), Roma Fiumicino (265km; 3h 20rsquo;) and Roma Ciampino (285km; 3h 30rsquo;).DESCRIPTION OF THE BUILDINGThe farmhouse (1.455 sqm ndash; 15,598 sqft) is laid out onto three above ground floor and a basement, including 12 independent apartments, 6 independent bedrooms and several locals earmarked to the hosting business.In the basement we can find a gym (70 sqm ndash; 753 sqft) with dressing room and bathrooms to be restored plus a cellar (18 sqm ndash; 194 sqft) in builderrsquo;s finish. The common area (388 sqm ndash; 4,175 sqft) is laid out onto three floors and includes: reception, offices, kitchen, 2 entrance halls, corridors, 2 breakfast room (capable of hosting up to 60 guests), pool area, 3 bathrooms, storage room, 4 under-stairs closets and 2 lofts. On the outside, we find a portico (34 sqm ndash; 366 sqft).The remaining part of the building is occupied by the apartments and the bedrooms for the hosting activity:- Private apartment (102 sqm ndash; 1,097 sqft): entrance hall, kitchen bedroom, living rooms and dining room. On the outside there is a loggia (28 sqm ndash; 301 sqft) with two storage room (7 sqm ndash; 75 sqft) and an ample terrace (61 sqm ndash; 656 sqft).- Apartment Ndeg;1 (139 sqm ndash; 1,496 sqft): living room with kitchenette, 2 bathrooms and 5 bedrooms.- Apartment Ndeg;2 (59 sqm ndash; 635 sqft): living room, dining room, kitchen, under-stairs closet, double bedroom and bathroom. On the outside there is a private portico (16 sqm ndash; 172 sqft).- Apartment Ndeg;3 (117 sqm ndash; 1,259 sqft): entrance hall, 2 bathrooms, 4 bedrooms, living room and kitchen. On the outside there is a terrace (20 sqm ndash; 215 sqft).- Apartment Ndeg;4 (49 sqm ndash; 527 sqft): living room with kitchenette, 2 bedrooms and bathroom. On the outside there is a terrace (23 sqm ndash; 247 sqft).- Apartment Ndeg;5 (65 sqm ndash; 699 sqft): living room with kitchenette, 2 double bedrooms and bathroom. On the outside there is a 16 sqm (172 sqft) private portico.- Apartment Ndeg;6 (59 sqm ndash; 635 sqft): living room with kitchenette, double bedrooms and bathroom.- Apartment Ndeg;7 (91 sqm ndash; 979 sqft): entrance hall, living room with kitchenette, 3 double bedrooms and 2 bathrooms. On the outside we find a terrace (24 sqm ndash; 258 sqft).- Apartment Ndeg;8 (43 sqm ndash; 463 sqft): living room, kitchen, bathroom and bedroom.- Apartment Ndeg;9 (66 sqm ndash; 710 sqft): entrance hall, bathroom, living room with kitchen and bedroom.- Apartment Ndeg;10 (39 sqm ndash; 414 sqft): entrance hall, living room with kitchenette, double bedroom and bathroom.- Apartment Ndeg;11 (69 sqm ndash; 742 sqft): living room, kitchen, double bedroom, bathroom and closet.- Bedroom Ndeg;1 (25 sqm ndash; 269 sqft): entrance hall, bedroom and bathroom.- Bedroom Ndeg;1 (31 sqm ndash; 333 sqft): bedroom and bathroom.- Bedroom Ndeg;3 (29 sqm ndash; 312 sqft): entrance hall and bedroom with bathroom.- Studio apartmentNdeg;4 amp; Ndeg;5 (45 sqm ndash; 434 sqft): entrance hall, 2 double bedrooms and a bathroom.- Bedroom Ndeg;6 (23 sqm ndash; 247 sqft): bedroom with bathroom.There are also three annexes, respectively 50, 20 and 30 sqm. The first one is already usable while the other two are to be restored.STATE AND FINISHESThe building, dating back to the mid-18th century and realized in typical Tuscan style, was fully and attentively restored to preserve the main characteristics of the building unchanged. Stone walls have been brought back to their original beauty, while on the inside the wooden beams have been restored, as well as the rib vaults and the arches connecting the various rooms.EXTERNAL AREAThe land surrounding the property (2.6 hectares) is partially reserved for the garden of the Agriturismo, where we also find the 17 x 6 m pool with solarium. The remaining surface is split between woodland, small pieces of arable land and even a small pond with fishes and turtles. Three beautiful stone wells (no longer functional) have been left on the garden as decorations.USE AND POTENTIAL USESThe property is currently working as Agriturismo and hosting activity, thanks to the great number of beds it can offer. The size of the building is perfect if one wants to continue on this way, keeping in mind that it is possible to keep one (or more) of the apartments for oneself.